cover a topic that LQDN is working on. E.g. Net Neutrality, copyright in the digital domain, online privacy, etc. reflect generally speaking the opinion of LQDN or directly quote or refer to LQDN. be published in a serious newssource, such as national papers (Le Monde, The New York Times, ...), regional papers (Quest-France) or international papers (International Herald Tribune, Deutsche Welle, ...). be recent and the more important the media sources, the more important it is that we publish the summary quickly. Articles by news sources such as PCInpact or TorrentFreak should only be included when the article is a scoop, contains important new information or if they quote/refer to LQDN. do not have a permanent link but are only temporarily on the front page. only contain links to other websites (such as netvibes or urlfan). are blog entries or from an obscure news sources no one has ever heard of. are the political voice of a political party. In this sense, LQDN must remain impartial. On the IRC channel #laquadrature you enter !rp url_of_article. 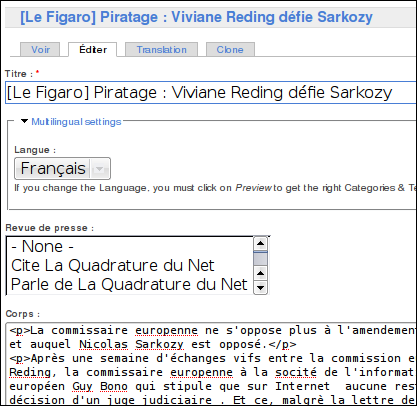 Use the command !rpc for articles that quote LQDN (c = citer, quotes in French). This assignes a higher priority to the articles in the rp list. Add a the end of the command, e.g. !rpa, !rpca...) to immediately assign the article to the archives, in effect informing others that the article is not worth publishing. The bot Wantzel should reply to your command (if they didn't, there was a problem somewhere) confirming whether or not the article was added to the rp list. Everyone is able to add articles to the rp list. But with great power, comes great responsability. Every url that was submitted by mistake will make someone lose their time processing and discarding it. If you're unsure about the worth of an article, ask on the channel before submitting the url. Number of the article in /rp. This is only useful in order to communicate to others which article you are working on. Date on which the article was added. Open url location (blue icon). When you click on it, the url is opened up to the website of the article. Export article to a Drupal Node. See below for further explanation. URL of the article""". When you click on it the url will appear on the right-hand side of the window with a snapshot of the website below. Note. How many points the article has been assigned. This tells you whether the article should be published or not, and with what urgency. Thumbs up and down. Clicking on these will add or subtract points to the article. If the thumbs are beige it means the article has not been evaluated fully yet. Red, it means that it shouldn't be published. Green (three points or more), that it should be published. Go to this Drupal node. The whole point of this RP list is to identify which articles to publish and which to NOT publish. Thus only the "untreated" articles will appear in the list. NB: These articles are at "2" and this means they will not be published. they write about our topics in an interesting, intelligent and/or original way. articles that have the same content as another, better, article with the same content. Exceptions might be made if the article quotes/refers to LQDN. If you are unsure, don't mark it either way. If you like the article, add a point. If you don't, take one off. Un EXTRAIT court et pertinent de l'article. C'est généralement là qu'est le gros du boulot, Y recopier de l'article 1 à 2 paragraphes pertinents, 3 si c'est vraiment intéressant. Si besoin, mettre des [...] pour faire une ellipse, mettre les citations en italique (<i>"citation"</i>), les citations de la Quadradure en italique et en gras (<i><b>"passage citant la Quadrature"</b></i>), et mettre le nom la Quadrature en italique (<i>passage qui parle de la Quadrature</i>) et le nom de la personne qui parle en italique. This page was last modified on 27 February 2014, at 13:17.